Do you have a question regarding check in times, parking information, pet policies – well, we’ve got the answer(s). And if we didn’t answer your questions below and left you wondering, contact us or phone us at 617.536.5300 and we’ll get right back to you. …Back Bay? Located in the heart of Back Bay. …Hynes Convention Center? Three blocks. …Faneuil Hall Marketplace? Approximately 2.5 miles. …Fenway Park? Approximately 6 blocks from the hotel. …Museum of Fine Arts? Approximately 7 blocks from the hotel. For a map and more information on sights and attractions near the hotel, go to Our Map. From Logan International: 2 1/2 miles, 15-45 minutes. From Manchester, NH’s Regional Airport: 50 miles, 60 minutes. From Providence, RI’s T.F. Green International Airport: 58 miles, 70 minutes. Back Bay Amtrak & Commuter Rail Train Station, 1 block from hotel. Copley “T” Station – Green Line, 1/2 block from hotel. Will the hotel arrange transportation? Yes, the Concierge will gladly assist with airport transportation, limousines and car rentals. Does the hotel offer dry cleaning services? Yes, the front desk handles all laundry and dry cleaning services. Same day options available. How can I obtain reservations/tickets to dining and the arts? Our Concierge is happy to assist guests with ticket arrangements, as well as sightseeing tours, dining and other recreation. Yes, we offer complimentary high-speed Internet access to a T-1 line in all of our guest rooms and suites. We provide complimentary WI-FI in all guest rooms, meeting rooms and public areas throughout the hotel. Yes, we offer 24-hour complimentary access to our business center, which is equipped with a computer and printer. 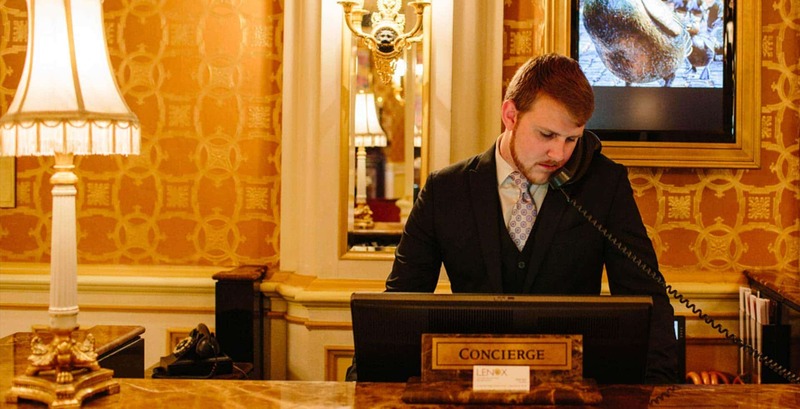 Please ask our Concierge for assistance. Is early check-in and late check-out available? Yes, regular check-in is 3:00 pm and check-out is at noon. To make other arrangements, please advise the reservationist when securing your room. We will be happy to accommodate special requests based on availability. The hotel provides valet parking at a cost of $53 overnight, which includes unlimited in-and-out privileges. The nearest self-park garage is just a few buildings up Exeter Street in the Prudential Center. Does the hotel offer ADA accommodations? Yes, the hotel has ADA-compliant rooms, including one suite. What are room service hours? Room service offers a complete menu and light fare 24 hours a day. American Express, VISA, MasterCard, Discover and Diners Club. Do you have a fitness facility? Yes, The Lenox offers complimentary use of our fitness center, 24 hours a day. Free weights, Nautilus, and cardio equipment available. Can I ship my packages to the hotel before my arrival? Yes, if shipping five or fewer packages, The Lenox can store and process your packages without charge. If you are shipping six or more packages, a $25 storage and handling fee applies. To ensure proper delivery, please be certain the name on the package(s) matches that of your reservation. Please email the concierge with any questions. Do you allow dogs on property? The hotel is “dog friendly” and permits small dogs 50 lbs and less. Please note that we do have a one time deep-cleaning fee of $125 per stay for any guests traveling with dogs. Dog sitting services available. “Green space” is available just two blocks away on Commonwealth Avenue. Please contact us for additional details. Yes, we have 3 food and beverage outlets: City Table, Solas and City Bar. Click here for more details. The Lenox has an ATM located in the lower lobby level. For most reservations, our cancellation policy is 24-hours prior to arrival. This may vary based on rates & dates, so please check directly with us to confirm. Yes, please reach out directly for availability and rates. Yes, our 11th floor is dedicated to reducing allergens. Please reach out directly for availability and rates. What type of ID do you require at Check in? We require an official ID for check-in. You must be 21 or over to check-in and stay alone. Do you allow smoking at the hotel? No, by law, all hotels in Boston are smoke-free. Does the hotel offer cribs or rollaway beds? Cost? Yes, cribs are complimentary, rollaway beds are $30 additional per night.